The Access Restrictions feature of Linksys routers allows you to limit Internet access to your network. You can deny certain computers’ Internet access or block certain applications and services. This article will provide instructions on how to set up Access Restrictions by blocking certain days or hours using the web-based setup page. If you want to set up Access Restrictions using keywords or websites, click here. NOTE: If you are using a Linksys Wi-Fi Router or a Linksys X-Series Gateway with Linksys Connect, you may click here for instructions in setting up Parental Controls. If you are using a Linksys Wireless-N router click, here. NOTE: In this example, Linksys E1000 router is used. Access the router’s web-based setup page. If you are using a Windows® computer, click here. For Mac® computers, click here. On the setup page, click the Access Restrictions tab. Select a number from the Access Blocking Policy drop-down menu then enter your preferred policy name. NOTE: You can create up to 10 Internet Access Policies. Click Edit List to add devices to the Policy. 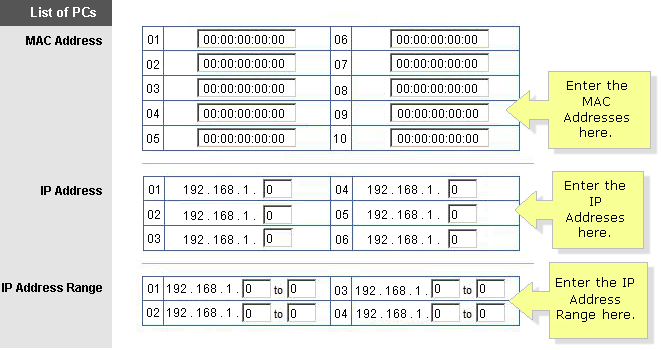 Specify devices by IP Address, MAC Address, or IP Address Range in the List of PCs screen. NOTE: To know how to check for a computer’s wireless MAC Address, click here. For instructions on checking the IP Address, click here. Click Save Settings. Then, click Close. Select Deny to block the listed devices from Internet access then select Every Day or choose specific days of the week to block Internet access on. Select 24 hours or select a specific time range when Internet access will be blocked. Enter the URL names of the websites you want to block in the Website Blocking by URL Address fields. To block specific applications and services, select the services from the Applications list then click the right arrow button. NOTE: You can remove the applications from the Blocked List section by selecting the application and clicking the left arrow button. NOTE: If you can’t find the application you want to block from the Applications list, add this application to the list by entering the Application Name and its Port Range in the specified fields. Select the protocol in the Protocol drop-down menu and click Add. Access the router’s web-based setup page. If you are using a Windows® computer, click here. For Mac® computer, click here. Select a number from the Internet Access Policy drop-down menu then enter your preferred policy name. Click Edit List of PCs to add devices to the policy. NOTE: To know how to check a computer’s wireless MAC Address, click here. For instructions on checking the IP Address, click here. Select Deny to block the listed devices or Allow to permit Internet access to the selected devices then select Everyday or choose specific days of the week to block Internet access. Select the service or application you want to block from the drop-down menu. NOTE: If the service you wish to block is not found in the Blocked Services drop-down menu, or if you wish to edit some of the details of a specific application, click Add/Edit Service. Enter your preferred Service Name and its corresponding Protocol and Port Range then click Add. Once done, click Apply. Enter the URL name or the keywords of a website you wish to block in the Website Blocking by URL Address or the Website Blocking by Keyword section.